Muzaffarnagar, Baghpat, Kairana and Ghaziabad go to polls on April 11. The Bhartiya Janata Party (BJP)’s performance in both the 2014 Lok Sabha election and the 2017 Assembly elections in this area was record-beating. Can the party repeat its record in 2019? Take Baghpat. Arithmetic answers some of the question marks. Former Mumbai police commissioner, Union minister of state for HRD in the Modi government and Jat strongman Satyapal Singh has every resource at his command. In 2014, he trounced SP’s Ghulam Mohammad by a margin of just over two lakh votes, while Rashtriya Lok Dal (RLD) chief Ajit Singh was relegated to the third position in his own ‘karma bhoomi’. This time, a youthful Jayant Chaudhary, heir to Ajit Singh and Chaudhary Charan Singh is trying out his fortune in Baghpat. And it is going to be tough, tough, tough for the BJP to retain the seat. The reason is caste. In 2014, Satyapal Singh polled around 400,000 votes and won by a margin of around 2.30 lakh. But add up the votes polled by Ajit Singh (who stood against him in 2014) and Ghulam Mohammad. Ajit Singh got around 1,99,000 and Mohammad got around 2.13 lakh. Their total vote is almost equal to the total votes polled by Satyapal Singh. But assume for a moment that the followers of Ajit Singh and Ghulam Mohammad (who is not contesting this time) are not homogenous and some could also support the BJP. The wild card is Prashant Choudhary. In 2014, Baghpat took note of Choudhary who is a Gujjar leader and contested as a Bahujan Samaj Party candidate. Gujjars hold sway over parliamentary seats of Gautam Buddh Nagar,Meerut, Kairana, Bijnor, Muzaffarnagar, Saharanpur, Bulandshaher and also Baghpat. They are influential although not that numerous in Baghpat (about 45,000 votes). He polled 1.42 lakh votes and is thought to have got, not just the majority of the Gujjar vote but also Dalits who are around 11 per cent of the population. There are two kinds of Dalits in the constituency: Valmiki (about 20 per cent of the total Dalit population and largely supporters of the BJP) and Jatav (80 per cent who only vote for Mayawati). As part of the seat adjustment, there is no BSP candidate. Which way will the Gujjars and Jatav Dalits vote? Will they favour the youthful Jayant Choudhary? Or will Modi’s appeal translate into support for Satya Pal Singh? Very hard to say. And as in Kairana, so also in Baghpat, a united opposition holds the key with the upset coming from the Gujjars. Then there’s Kairana which saw a massive upset when after the death of Hukum Singh, the BJP offered the people his daughter Mriganka in 2018. She has been denied the seat this time and has made no secret of the fact that she is hurting. True, Hukum Singh enjoyed huge support and respect in the constituency and being a daughter is not quite the same thing. Mriganka lost the 2018 by election to Tabassum Hassan who is a joint opposition candidate. But wait! did we say opposition? The Congress has fielded its own nominee: Harinder Malik who is respected but by no means the unanimous choice of the voters, especially minority Muslim voters who number around 5 lakh out of a total voter population of 16 lakh. Tabassum Hasan got 51 per cent of the vote in the last election in 2018. That was because there was no opposition from anyone except the BJP. But Congress’s Malik is expected to be a spoiler. Malik is not a political nonentity: he speaks the local idiom and has a standing among the populace. But privately, he has told his supporters that he is a lamb to slaughter: he cannot win without the support of the Muslims and the Muslims are all going to vote for Tabassum Hasan. ‘Even BJP supporters will vote for her’ predicted Iqbal who is a small traders. Why even BJP? The reason is BJP denied Mriganka Singh her rightful claim and has replaced her with Pradeep Chaudhary. The average BJP worker is in a deep sulk. But either way, the vote will be Modi’s. Or anti-Modi. The chances of BJP losing this seat are extremely high. Muzaffarnagar is the heart of western UP. 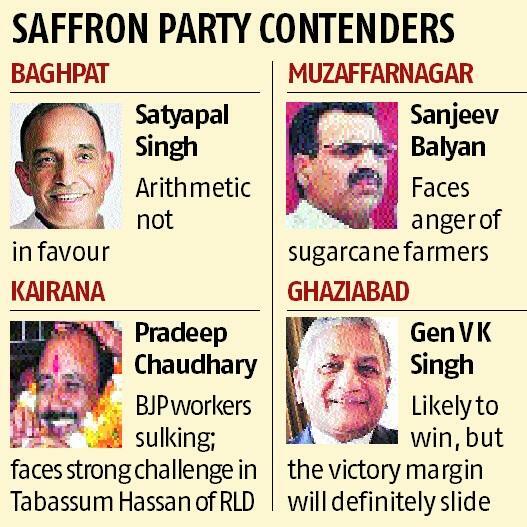 Here, Choudharysaab (as he is known in these parts) Ajit Singh is pitted against Sanjeev Balyan of the BJP. Balyan is curiously uncertain about his chances of winning. He is no pushover: a highly qualified doctor and scientist, he won by a margin of 4 lakh votes in 2014. But the heart of the problem in Muzaffarnagar is sugarcane and all the attendant problems. But that’s not all. Balyan is one of the accused in the 2013 Muzaffarnagar riots. In this area, communal feelings run high. In neighbouring Saharanpur is Imran Masood, the Congress candidate who is a firebrand Muslim crusader. There is a spillover from Saharanpur. Balyan may face heavy weather this time. Ghaziabad calculations have gone awry because of the presence of charismatic Congress candidate Dolly Sharma, an MBA. Although there is hardly any chance of defeat for the systematic booth-level coordination by Gen VK Singh who has been repeated as the BJP candidate (and who won by the highest margin of votes after Narendra Modi in 2014), that performance seems hard to replicate….he will probably retain his seat but the margin will definitely come down. SP-BSP-RLD combine's candidate Suresh Bansal questions all the claims of development in the constituency by VK Singh. He is banking on the support of the minorities. But Muslims are torn in two: they would like to vote for the Congress, but may end up supporting Bansal. In 2014, except Saharanpur, BJP candidates in all seven constituencies in this region defeated their rivals by more than 2 lakh votes. 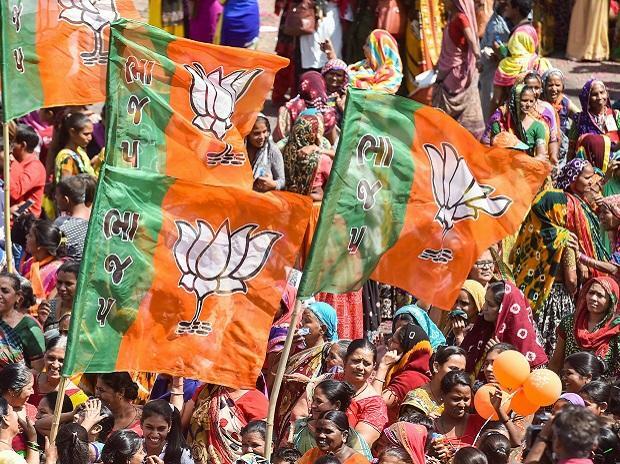 In Saharanpur, the BJP candidate won by 65,000 votes. This time? Jat leader and agricultural scientist Sompal Singh who was also a union minister in the VP Singh government is pessimistic about the chances of the BJP.